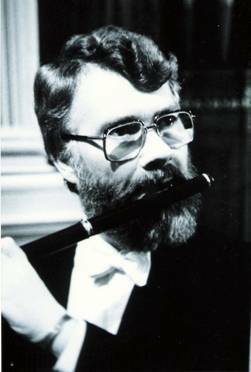 Roger Rostron (b.1937), first studied with John Francis and then continued later with Edward Walker at the Royal College of Music after spending his National Service days with the Band of the Irish Guards. He spent nearly three years with Sadler’s Wells Opera Orchestra before moving to Manchester to become sub-principal flute with the BBC Northern Symphony Orchestra, remaining until 1967 when he took up the appointment of Principal Flute with the Hallé Orchestra. He has appeared as soloist with the orchestra and as chamber musician with various ensembles. More recently he has been Tutor in charge of orchestral studies at the RNCM and Teacher at Chetham’s, Manchester. 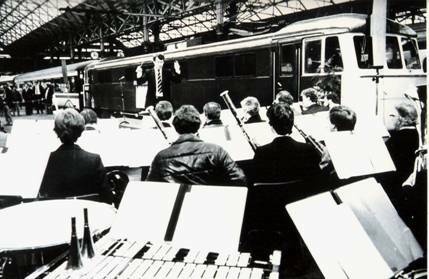 Roger Rostron conducts a Hallé ensemble at the launch of a new locomotive named “Sir Charles Hallé”, Piccadilly, Manchester, 29 November 1983.